The Eglu Go Chicken Coop is designed to sleep between 3-4 bantams or 2-3 larger breeds such as Brahmas and Buff Orpingtons. It is available standard with a 2 metre run including a shade, as well as a feeder and drinker. The run can also be extended by 1m to make it longer to give your chickens more space to move round. Accessories such as extra feeders, drinkers, durable covers and jackets can be purchased seperately to protect your chickens and your coop from the elements. 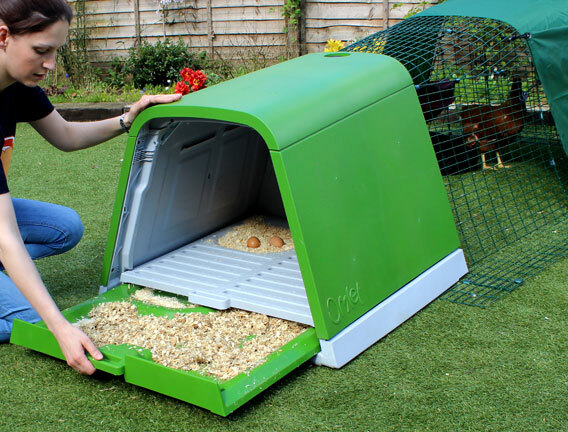 The Go itself is double insulated keeping your chickens warm in the winter and cool in the summer and is available in Green or Purple and is UV protected against harsh sunshine. The Go run design means you can position the door on either the side or the end panels. This is useful if you want to fit the Eglu Go into a spot where accessing the run would be more convenient from the side. This manual will cover the parts you should receive with your Go, and step by step illustrated instructions on how to assemble the Go from start to finish. You will also find advice on how to maintain your Go and also tips and hints on keeping and looking after your chickens. The total build time for constructing your Go is roughly around 1.5 hours.